Of This New World, by Allegra Hyde. Iowa City, Iowa: University of Iowa Press, October 2016. 124 pages. $16.00, paper. All writers want to create new worlds. Good writers want to explore new worlds. Great writers want to expose new worlds. In Of This New World, the readers are exposed to twelve beautiful worlds and the inhabitants who survive in them. Allegra Hyde has her fingers on the pulse of today and the particular patterns humanity follows time and time again. Bookended by a tale of Eden and a vision of Mars, this collection creates worlds that act as characters and reminds us of the hunger humanity needs to control when it comes to the world we want. The short story collection, a winner of the John Simmons Short Fiction Award, has a chronological feel to it that, intentional or not, creates a sort of super thread linking the stories together. It begins, fittingly enough, with the original utopia of Eden. “After the Beginning” has a post-modern Biblical feel about it, opening with the mood setting line: “After the beginning, even seven days out, my husband still makes me crazy.” Imagine a world where Eve might not enjoy the company of Adam. From the start, Hyde is focusing on the world we create for ourselves, not the world found for us. This isn’t necessarily an easy thing to do, considering the Garden of Eden is one of the oldest stories we tell each other and yet Hyde manages to breathe new life into it. This is one of the noticeable traits within all the stories. Test question #3: And what is it—your idea of paradise—what is it exactly? (a) The red petals of hibiscus flowers pressed closely like the folds of a lady’s skirt. (b) A quivering Casuarina pine, shaking free a thousand needles. (c) Those many-footed mangroves, stooped and wading through their salty parlors. The narrator sees that while Camp Hope has the best intentions, it settles into a two steps forward, one step back kind of mentality. The world would be perfect, it seems, if it only worked in this very specific way. It has no use for other views of it. This is the foundational problem with creating worlds, for everything you make, you equally destroy something else. It’s difficult to continue reading after that revelation, although Hyde is able to continue exploring new ground of the very worlds she set on exposing. There are worlds both deeply personal and worlds that are infinitely expansive. She breaks old worlds to create new ones. “Delight®” is a cautionary tale of over-marketed imaginations. “Americans on Mars!” is a futuristic story about the outsider left behind in a brave new world. There is a sense of urgency in these stories, that while we can control the creation of the world around us, we should do so warily, with healthy skepticism and responsibility. We owe it to the world to act accordingly. 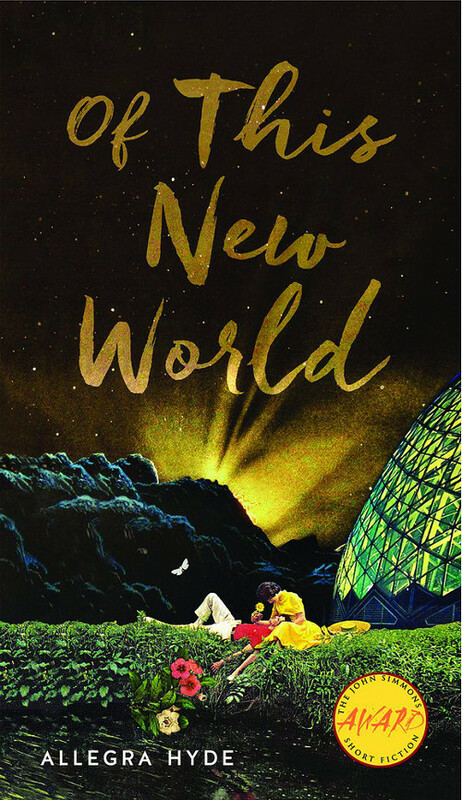 In a world of impossible tomorrows and yesterdays, Allegra Hyde manages to keep us grounded with Of This New World.